EXPERIENCED FORT WORTH CRIMINAL DEFENSE AND PERSONAL INJURY ATTORNEYS. 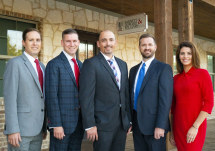 At Barnett Howard & Williams PLLC, our attorneys assist people in Fort Worth, Texas and Tarrant County with criminal law matters and those that have been injured in an accident. We will protect your well-being and zealously represent your interests. We know that every case is unique. You can count on our Fort Worth criminal defense and personal injury lawyers to provide the personal attention your case requires to be successful. We will take the time to listen to you and learn your side of the story. We will find out what you want to achieve. We will create a legal strategy just for you, designed specifically to help you move forward with your life. Our law firm features former prosecutors, U.S. Marine Officers, and a team with in-depth experience and a commitment to doing right by you. We are skilled negotiators, but we also have the strength to stand up for your rights at trial. Our record of results is proof of our ability to help you overcome any criminal defense case, or any other legal challenge you may face. We realize that you are coming to us in a time of need. You are likely under a great deal of stress. There may be heavy emotions involved. We will earn your trust by taking immediate action to take the stress off your shoulders. We will get you through this.